When Sula Vineyards, invited me to experience, an extravagant “Gourmet World Music Festival”. I was ecstatic! #SulaFest has to be the highlight of the year so far, as a travel and lifestyle blogger. I have attend music festivals earlier in Ibiza, Goa and Bangalore. But this was my first time travelling as an insider to share my experience. I didn’t have any expectations, and decided to go with the flow. I love wine & music and somehow this was just the perfect invite. Here is what went down at the 10th Edition of Sula Fest. It was an amalgamation of Wine, Music, Food, and Fashion with like minded people. Epic vibes, the energy and sheer madness that erupted over the three days, I shan’t forget. It was an intoxicating weekend! I flew in from Bangalore to Mumbai and had about a four hour road trip to arrive at Nashik, Mecca of Vineyards in India. This place is sprawling with vineyards. All top of their game, producing some of the world’s award winning wines. My flight was to depart early hours from Bangalore, but due to intense smog we were grounded in the plane on the tarmac for about 2 hours. Landing in Mumbai, I was greeted by humid air, a huge difference from Bangalore chill weather during February. Getting out of the airport was fast, and the pace was surreal to me. But first wait for it…Starbucks! The drive to Nashik from Mumbai is about 168kms or so, which is about 4 hours. We were a group of media teams in a mini van. Enroute, I just plugged into my playlist and gazed out to see a bit of Mumbai and the surrounding areas. The accommodation provided was not the Ritz but quite nice, some of us were put up at Treebo 07 Nashik Inn. Close by to Sula Vineyards. Its 4 star rating. The staff was attentive and provided us homely Maharashtrian breakfast. It was filling and not something I had ever had like Misal pav ( I actually looked around to see how to serve and eat this dish from the buffet counter). This year unlike before, the festival was a 3 day affair. Friday saw top Indian Artists perform. With top acts Nucleya, Indian Ocean, Infected Mushroom, Bloc Party, Loco & Jam, Dubioza Kolektiv, Hilight Tribe, Afro Celt Sound System, Jan Blomqvist and Band, The Raghu Dixit Project, Dhruv Voyage, Ska Vengers and much more. Sula’s all new musician talent hunt competition “Rise and Shine” contest winner – Anhad played as well. The 10th edition of SulaFest saw various genres of music performing on three stages – The Amphitheater Stage, Atmasphere Stage and Tropical Stage. For music lovers it was an absolute thrilling and invigorating experience. Another new addition to the festival this year was the ‘Globe in a Glass’ stall where fest-goers had the opportunity to meet and taste with the people behind various brands from the Sula Selections portfolio. The renowned wine profile Robert Joseph, who attended for the first time this year, showcased his brand Le Grand Noir. Sula also launched their new limited edition Valentines wines at the festival, this being a big hit. Also, a SulaFest 10th edition signature drink ValenSeco had been created – a mix of Sula Seco Rose and RAW Pressery Valencia Orange juice. In addition, there was Whisky, Beer, Vodka, Liqueur, Tequila, Sambuca and even Bourbon on offer – Jack Daniels, Budweiser, Monkey Shoulder, Cointreau, Grant’s, Skyy Vodka, Aperol, Antiqua Sambuca and Jägermeister to name a few! The festival welcomed Hershey’s premium chocolate ‘Brookside’ on board this year. Fest-goers had the opportunity to try three exotic flavors – Pomegranate, Raspberry & Goji and Blueberry & Acai! They also paired well with a wide variety of wines. SulaFest benefited the local NGO’s and non-profits. Apulkee (farmers welfare), Sharan (animal welfare), Hausla(children welfare), Awhaas (animal welfare). When in Rome, do as the Romans do! When on a vineyard, drink Wine and lots of it! Sula Vineyards’ Tasting Room and Tasting Cellar had special tours and tastings to wine lovers and enthusiasts all through the days. Celebrations are never complete with out food, and Sula Fest, had an array of gourmet food spread across. You take your pick. Sula Fest did an awesome job of catering to the tastebuds. Armed with food coupons, it was a bit of a daunting task to pick the meal, crowds flung to each of the food stalls. Once you did get your meal, it was decision time to park yourself to relish the food. The experience was surreal, like a huge picnic. I loved the Sula Rose and stuck to it mostly, Sula’s Reisling, desert wine was also another favorite. Raw Pressery, India’s largest cold-pressed juice brand had some amazing flavours to keep us well hydrated as well. The panoramic views of the vineyard, to the amazing set up and well-organised event has left me craving to come back next year for more. Being a traveller at this venue and event, I can vouch that it was absolutely safe. There were security and bouncers all around. I had an thrilling ride. I had truck loads of fun, met and made new friends. It was loud, overwhelming and overall just beautiful, at the same time. Internet sucked, which in a way was great as I ended up enjoy the festival more. I have tons of images from the event and hope to make a video out of it soon and share with all of you, tried to upload but failed, so next time! Thank you Sula Vineyards for the hospitality. Cheers and here is to many more! 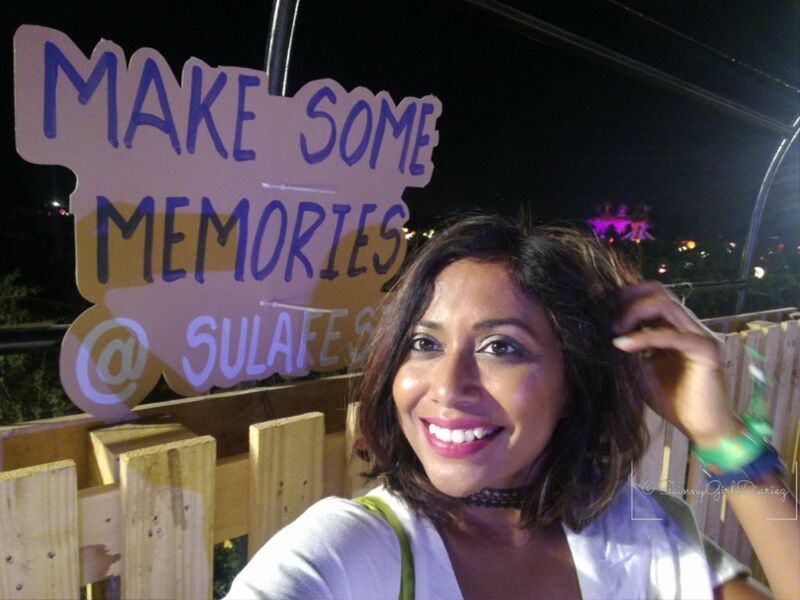 Have you been to Sula Fest, what was your experience like? Would love to hear from you! Sula Vineyards is by far India’s first choice in wine. Their award-winning wines are available nationwide at the finest hotels and restaurants, and are also exported throughout the world. Sula is on track to sell a million cases of wine in 2016. Sula is also a pioneer in India’s wine tourism opening the country’s first winery Tasting Room in 2005 and first vineyard resort, Beyond by Sula, in 2007. With over 230,000 visitors last year, Sula is one of the most visited wineries in the world and the #1 spot where Indians first taste wine. Raw Pressery, founded in the year 2014, is India’s largest cold-pressed juice brand. Incorporated as a part of Rakyan Beverages Pvt. Ltd., Raw Pressery is a vertically integrated company with in-house capabilities in farm-produce procurement, processing, manufacturing, cold chain logistics, warehousing & distribution. It is the only Indian company to use the globally acclaimed revolutionary HPP technology which ensures fresher, safer and healthier food products with stable shelf life. The brand’s portfolio with over 21 different blends comprises of fruit juices, smoothies, nut milks, booster shots and hydration essentials.